The Angels recorded back to back league victories for only the second time this season against a Thurrock side who remain without a single point on the road for this campaign. Tonbridge fully deserved their one goal lead at the interval although it took them until the 42nd to get themselves in front. Nathan Elder skimmed the bar with a header in the 7th minute and just a couple of minutes later Alex Akrofi was able to go round ‘keeper Jake Jessup but on a narrow angle his effort skimmed along the goal line. Joe Turner’s terrific left wing run set up Akrofi but the goal hungry forward’s effort was blocked and the same player had another chance but his shot cannoned off a Thurrock defender. On 38 minutes Jack Parter set up Joe Turner but the left midfielder saw his shot go just wide of the left hand post. Tonbridge needed to turn their dominance into goals and eventually as half time was approaching a Turner free kick was fumbled by keeper Jessup with Elder on hand to fire the loose ball home. 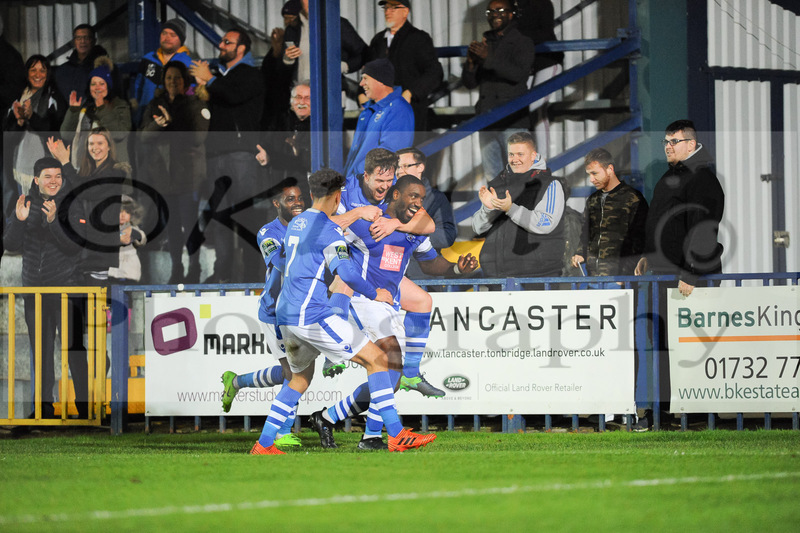 There had been just the one worrying moment for Tonbridge in the 16th minute when somehow Dennis Oli wriggled his way through the Angels defence but Jonny Henly was there to snuff out the danger. The second half was only six minutes old when the game appeared to have been made safe as Tonbridge scored their second goal. Despite strong appeals for an Angels corner only a throw was awarded to the home side but they made the most of it with the ball falling to Parter. His well struck but low cross into the danger area saw Akrofi get in front of his marker to slot the ball past Jessup. It should have got even better for the Angels on 69 minutes when Elder’s header fell invitingly into the path of Akrofi but his lob was misjudged and went sailing over the crossbar. As the game moved into its last 15 minutes, Thurrock suddenly realised they were in a football match and at last started to push men forward. The Tonbridge defence superbly marshalled by Sonny Miles and Craig Stone largely withstood the pressure and no real chances were created. It was something of a surprise therefore when in stoppage time from yet another free kick Lewiss Spence rose highest at the far post to head home for a very late consolation.